Thus it appears trees far more productive than wind turbines. Is this true? Are these assumptions correct? Wind turbines do not turn the ground between them into desert. There is still farming and growth of various plants (even trees) possible. It should not be excluded in those comparisons and calculations. A wind turbine with 3MW power, rotor diameter of 100 meters rotating at a hub hight of 100 meters may allow growing plants with a height up to 25 meters (~ 80 ft). A tree farm of that size in a temperate climate would only produce ~1.7GWh/y (net). You are overestimating the productive value of trees by a factor of ~15. A 5MW wind turbine can produce a maximum of ~44GWh a year. Your assumed figure of 1GWh is only 2.3% of its rated capacity. No-one would bother financing/building a turbine on that site if they could only harness 2.3% of the maximum energy possible. The average load factor of on-shore wind turbines in Denmark over a 20-year period was ~21%, so based on those, you are underestimating the productive value of wind turbines by a factor of ~9. So, having assumed that trees are 15x more productive than they are in the real-world, and having assumed that wind turbines are 9x less productive than they are in the real world, it is clear that your assumptions are wildly incorrect and thus so is your conclusion/suggestion that trees are (or may be) 25x more productive than wind turbines. "Under what conditions are trees more productive than wind turbines?" If we use a forest as a guide, a 250,000m² tree farm could thus produce ~193,750W. 250,000m² is a circle 282m in radius. Turbines need to be separated by 3-10x their sweep diameters for a variety of reasons (flow interference being the main one). Given that site details are unknown, let's use the average of 6.5x. A 282m radius field could thus support a single turbine with a sweep diameter of (282*2/6.5=) 86m. Such a diameter sweeps an area of ~5800m². The turbine power output equation — P = 0.5 × ρ × A × Cp × V³ × Ng × Nb — is then rearranged to calculate the wind-speed required to hit the power target. 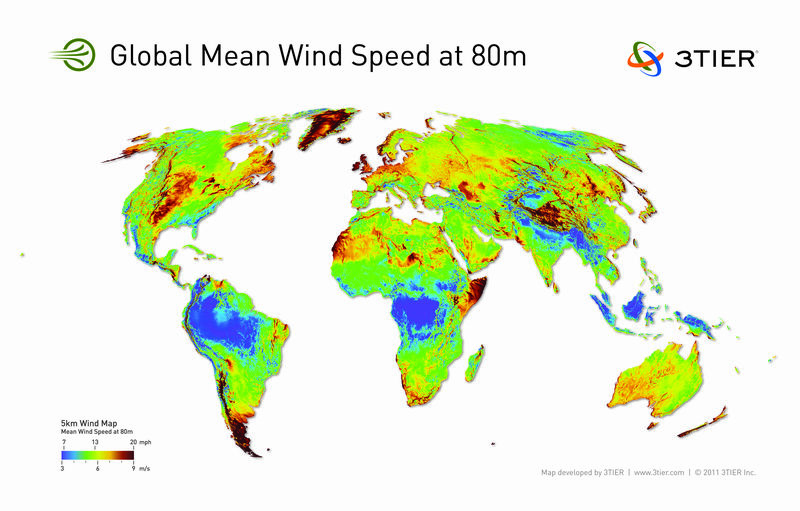 Assuming 95% gearbox bearing efficiency, 80% generator efficiency, Betz Limit coefficient of performance (0.56), and sea-level air density, the average wind-speed required to generate 193,750W from a 5800m² sweep area is 5.1ms⁻¹ (~18kmh⁻¹). This is the best-case scenario. Using a more realistic generator efficiency (65%) and coefficient of performance (0.35) means that an average wind-speed of 6.4ms⁻¹ (~23kmh⁻¹) is required. PS: You can look up the Mean NPP of various ecosystems here. Convert from grams to Joules by multiplying by ~20,000 (for deciduous hardwoods). Then divide by 31,556,952 to convert J/yr to Watts. Example: Temperate Deciduous Forests have a NPP of 1200g/m²/yr. 1200 * 20000 / 31556952 = 0.76W/m². It's possible to get more accurate numbers if you know the mix of species and the latitude, or if you have access to journals behind paywalls, but for general use you can just use the Wikipedia numbers for a satisfactory approximation. The question assumes a false dichotomy: Trees or turbines. The actual turbine footprint is small, leaving most of the land available for other purposes. 250,000 m2 is roughly 500m x 500m A 100m diameter rotor needs to be more than 500m away from the next one, probably around twice that. This article: https://www.sciencedaily.com/releases/2011/01/110120111332.htm suggests 15 rotor diameters. This favours the argument for trees. In rolling country, siting turbines on ridges and using valleys for some other function makes sense. If the tradeoff is to grow biomass for fuel use, you have a whole bunch of other considerations. The bugbears of biomass use for fuel in temperate climates are harvest, transport, and seasonal storage. Efficiency of the biomass to electricity is a problem too. The uses don't have to be exclusive: One prominent biofuel candidate is switch grass. Because it doesn't get tree tall, it can be grown right up to the tower right of way. It also has advantages that many farmers already have the equipment to harvest and package (bale) it. If the terrain is rougher, then space between turbines can be used for pasture. Poplar trees grow quickly. Some commercial sources on the Internet claim that hybrid poplar trees can grow up to 8 ft. per year. Your calculations are actually conservative. Not the answer you're looking for? Browse other questions tagged renewables wind-power biofuels or ask your own question.